This is the fourth in my series of 20 ways to be more creative. 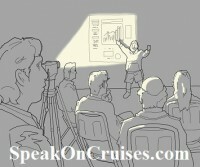 The cruise ship lecturer, keynote speaker needs to be able to welcome ambiguity. If everything is spelled out in advance, where is the on-the-fly, thinking-on-your-feet impulse to come from that makes for a different, not always better, but certainly unique presentation? Imagine going into a restaurant and being told to pick from items that are on the menu ONLY. Now imagine going into a restaurant and being given a list of items in the kitchen fridge and being told to pick any 5 items. One more time, imagine the second scenario and being given the option “Surprise Us!” Tell us what you want that we haven’t thought of. That last scenarios is quite iffy but will indeed lead to some new creations the restaurant and you may not have thought of. Creations and creative and creativity all have the same root. At the heart, the speaker needs to be able to welcome ambiguity, to allow for some unpredictableness, to have an attitude of make-do. Without that attitude, creativity will be left looking on its own for ways to be creative with you.